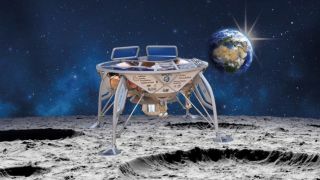 Israel's Beresheet lunar lander has crashed, putting an untimely end to the first privately funded mission to the moon. If successful, Beresheet would have made Israel the fourth nation to land on the moon (following the US, Russia and China), but as the BBC reports, the command center lost communications with the spacecraft as it approached its final orbit just nine meters from the surface. Are we getting close to finding 'Planet Nine'? The mission received some funding from Israel's government, but was mostly paid for through private investment. "We didn't make it, but we definitely tried," said Morris Khan, president of SpaceIL, which instigated the project. Beresheet launched aboard a SpaceX Falcon 9 rocket in February, and made a series of orbits around the Earth, gradually moving further away until it was captured by the moon's gravity. The craft experienced problems earlier in its mission, including an issue with its star trackers (essential for navigation), which became dazzled by the sun soon after launch, and an unexpected reset of its computer system, but all seemed to be going according to plan as the craft neared its target, and it successfully sent back some stunning images of its journey, including a striking video of the sun emerging from behind the Earth. Although Beresheet met a sticky end, it seems Israel isn't giving up. "If at first you don't succeed, you try again," said Prime Minister Benjamin Netanyahu, who watched the attempted landing from a control room in Tel Aviv.